Join Red Hat Chief Architect, Matt Smith, along with Tigera CTO, Solutions, Christopher Liljenstolpe, as they share their experience and knowledge helping leading enterprises achieve their key business transformation initiatives around moving to secure cloud-based, containerized microservice applications. 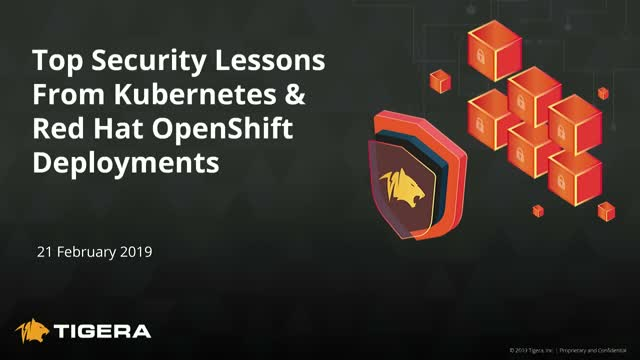 In this 60 minute webinar, they will cover their top lessons learned on network security and Red Hat OpenShift. + Network Flow Logs that record accepted and denied traffic, which policies denied the traffic, and workload context such as Kubernetes namespaces, labels, and metadata. Tigera Secure also provides dynamic graphical visualization of network flows. + Tiered policy controls with role-based access controls, to enable multiple teams to independently manage their respective security policies within the governance of the security team. + Anomaly Detection capabilities that provide insight into unusual behaviors and sophisticated attacks that compromise the security and performance of Kubernetes environments. Istio’s traffic management decouples traffic flow and infrastructure scaling allowing you to specify what rules to govern traffic rather than which specific pods should receive traffic. Learn how Anomaly Detection supports, what Gartner has termed, a continuous adaptive risk and trust assessment (CARTA) when building a CaaS platform using Kubernetes. Anomaly Detection expands the zero trust network security model and continuously assess the application and network risk that enables adaptive policy adjustments. Anomaly Detection identifies outliers in Kubernetes clusters by building profiles of typical workloads and components to know when they start to deviate from the norm. It also manages network risk by continuously monitoring for activities such as reconnaissance scan, service connections anomaly, service bytes anomaly, and pod outlier activity detection. Learn how to support a continuous adaptive risk and trust assessment (CARTA) approach leveraging accurate Kubernetes flow logs. 5-tuple logging is commonly used to monitor and detect anomalies and produces unreliable data that cannot accurately identify anomalies nor prove enforcement of security policies. Network flow logs include workload identity and other metadata that help continuously monitor activities within Kubernetes clusters. Learn how to support, what Gartner has termed, a continuous adaptive risk and trust assessment (CARTA) when building a CaaS platform using Kubernetes. Network security enables microsegmentation and is a core component of a zero trust security model. It allows you to protect your workloads against threats without relying on assumptions about the network, infrastructure, and workloads. when you need to expose your application or services to the public? The Domain Name System (DNS) is used to associate IP addresses with meaningful names. By default, Kubernetes clusters configure internal DNS to provide for service discovery automatically. This makes it easy for workloads to locate and work with each other on Kubernetes clusters. Are you looking into Istio? Many companies are investigating Istio to reduce the challenges of managing microservices as it delivers a uniform way to connect, monitor, and secure environments - especially used in concert with Kubernetes. Did you know that Istio is a part of the Tigera Secure solutions, that we play an active role in developing Istio, and we co-chair the Istio security special interest group? We'd like to share our expertise to help you understand how Istio fits into a comprehensive network security model. Attend our webinar on Tuesday, December 4 to learn about implementing a defense in depth posture that enables zero-trust network security across L3-L7 and allows Application, DevOps, Platform Engineering, Network, and Security and Compliance teams to seamlessly work together. Kubernetes is widely used to re-architect traditional applications. Many organizations first set up Kubernetes within their on-prem environment and then later expand to the public cloud. This hybrid environment often creates security and compliance challenges with workloads. Join this webinar to learn how to leverage universal security policy definition that works across a hybrid environment. While the Container/Kubernetes revolution is starting to deliver on its promise of making application development and delivery more agile and responsive, it does so by changing some of the traditional characteristics and behaviors of the development and delivery model. Control and compliance regimes have assumed that these would continue to be constant going forward. That set of assumptions is no longer entirely correct. Attend this webinar and learn about what's changed, how those changes weaken your compliance and control environment, and what you can do to not only adjust to the new reality but actually have your security team being a key enabler of the new agile model. In Kubernetes, Network Policy allows you to define a policy determining what traffic is allowed to flow to and from specific workloads. By default, Kubernetes permits ingress and egress traffic to and from all pods in a namespace. Without correct configuration your risk of a significant security breach is high. Attend this webinar and learn best practices in configuring Kubernetes network security. The success of Kubernetes has made monitoring and alerting more difficult for traditional Security Information and Event Management (SIEM) tools. Attend this live webinar to learn how implementing the right network security and compliance solution will improve the accuracy and completeness of security forensic monitoring and alerting when using Kubernetes. TLS v1.3 introduces several new security improvements over TLS 1.2 but some of these enhancements have an impact on network-based security solutions such as IDS/IPS. While the goal is to enhance the overall security at the application level, there are a few scenarios that are not easily solved when introducing the new technology, especially in Kubernetes environments. Watch this webinar to learn about security and compliance considerations for Kubernetes when implementing TLS v1.3. While a microservice architecture, orchestrated by applications like Kubernetes, offers a tremendous business advantage for time to market, proper security and compliance controls must be put in place. This is a crucial step when deploying microservices and teams must work together by using the proper tools during implementation. We will explore 5 things you can do to meet security and compliance requirements for your microservices stack. Watch this webinar to learn about considerations for security and compliance with microservices, understanding key principles for compliance, and leveraging the proper security tools and methods for compliance. Join this exclusive AWS webinar co-hosted with Tigera. We will demo how to implement turnkey compliance and security controls for Kubernetes in AWS and Amazon EKS environments. Join this live Q&A with Amit Gupta, VP Product Management at Tigera, as he provides tips, advice, best practices and industry insights into going cloud native. He will answer all of your questions live from DockerCon and help your organization discover why Kubernetes is the #1 container orchestration tool, how it plays a vital role in application security, and how clout native architectures help solve application connectivity problems. Join this live panel discussion with experts at DockerCon to learn why Kubernetes is the most popular container orchestration tool and why application security is key to your cloud native journey. - How are open source systems like Kubernetes changing the way we deploy, scale and manage applications? - How does Kubernetes enable the cloud-native journey? This live panel will be streamed directly from DockerCon 2018 in San Francisco! Join us live from the comfort of your desk. In this video we will compare CNI to some other well-known orchestration network interfaces (the way the orchestrator asks for network connectivity). We’ll also look at the difference between CNI and the Kubernetes Network Policy Interface. We’ll dive into some detail as to how CNI works and what has recently changed in CNI and what may be in store in the future with Gunjan, one of the CNI contributors. Tigera provides zero-trust network security and continuous compliance for Kubernetes platforms that enables enterprises to secure containers and applications with a least privileges model and defense in depth. Tigera’s technology is recognized and trusted as the de facto standard for Kubernetes network security.